Material testing will begin this Sunday, April 1st (and that's no joke)! Update: Canceled yet again due to weather forecasts for rain. We’ll try again soon. More news to come. 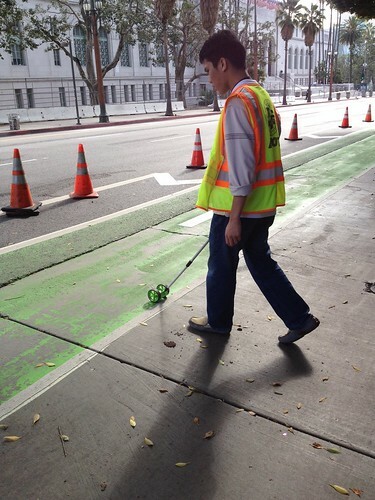 The Spring St. green bike lane will be undergoing a planned material test starting this Sunday, April 1st. Testing will occur along three blocks; 5th St. to 6th St., 6th St. to 7th St., and Aliso St. to Temple St. LADOT will be testing a variety of materials and application technologies to identify the best combination/s for our city’s unique roadways. For more information about the materials that we will be testing, check out our previous post here. We would like to remind everyone to please be mindful of the cones and to avoid driving on the coned off segments on the day of the installation. If you access driveways/garages on the west side of Spring along these three blocks, entry and exit will be restricted from 1AM-4PM. Be sure to plan ahead – consider moving your car to another street or lot in advance if you know you will need to use your car on this day. More information on these restrictions can be found at the Downtown Los Angeles Neighborhood Council’s website. Are you ******** kidding me?!?!?!?!? We’re talking about a plain, level street in the city! Is the rain different in LA? When it does rain! Who’s kool-aid are you drinking JoJo? I wish my job and duties was this easy as these LADOT techs! BTW, I’d be looking at OTHER CITIES that have done this already, not trying to blaze my own trail! At this rate and expense we won’t be looking at very much being done. And I’d bet my last dollar this is the same idiots that screwed this up the first time! Do you expect a situation where any future green lanes will require the use of a variety of materials/paints in some sort of patchwork? Perhaps the difficulty Ladot is having will convince you guys to limit the green to intersections and perhaps try out bike boxes or more obvious bicycle markings at intersections rather than trying to paint long lanes over a variety of pavement materials. The new lanes notwithstanding, LA is still a horrible city to ride in. Your intersections are perhaps the worst I have encountered and many people (cyclists included) seem to think that cars turning right in bike lanes have the right of way at intersections. Rene: a variety of materials/paints along a single corridor is something we would consider, if because of varying conditions along the corridor, performance of the material would benefit. For example, if a certain material performed better on asphalt versus concrete, or if a certain material was more durable and performed better in high-traffic areas, we could customize the type of material to the condition it works under best. 1st St. in Boyle Heights demonstrates the use of green infill only at intersections, driveways and bus zones – mixing areas, similarly to what you suggested. If we expand the use of green infilled bike lanes in the future, it’s possible that this layout will be more cost-effective and provide the greatest cost-benefit as well. All these factors are being taken into account as part of the pilot program.